We provide complete eye care for both adults and children. Beyond a thorough refractive examination to determine a spectacle prescription, our medical eye care service also includes diagnosis and treatment of eye diseases. Our comprehensive vision exam includes: checking visual acuity, refraction, binocular vision and ocular health. We can diagnose refractive conditions including far-sightedness, near-sightedness, astigmatism and presbyopia; strabismus (misaligned eyes), amblyopia (lazy eye), oculomotor dysfunction and conditions involving the health of the eyes. Certain health problems can affect your vision. Drs. Knutson and Lynch specialize in ocular diseases including dry eye, glaucoma, cataracts, macular degeneration, hypertension, high cholesterol and diabetes. Patients with health problems, especially diabetes, should get their eyes examined every year due to the increased risk of blindness. At Vivid Eye Care we are able to treat patients with dry eyes, allergies, cataracts, diabetes, glaucoma, macular degeneration and retinal conditions. Our office can also treat eye infections and ocular trauma. 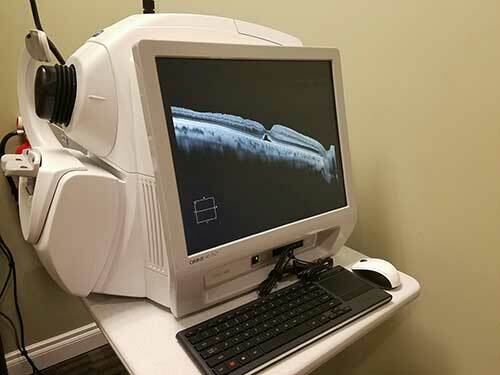 The Optomap ultra-widefield view enhances your eye doctor’s ability to detect even the earliest sign of disease that appears on your retina. The unique cutting-edge technology allows the doctors to view the retina without the use of dilating drops; although in many cases, dilation is still recommended. 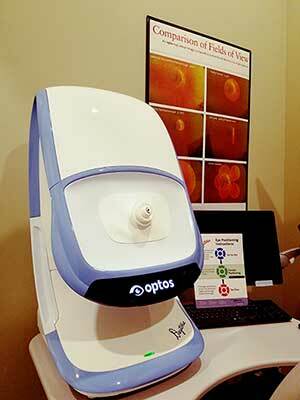 This technology is at the forefront of ocular disease detection and management. It is through the use of OCT that physicians today routinely diagnose macular diseases such as neovascularization, diabetes, and age-related macular degeneration. We offer consultation and comanagement of refractive surgery. Drs. Lynch and Knutson work with specialized lasik surgeons in the area that are experienced in pre and post-op Lasik. Through InfantSEE, we will provide a one-time, comprehensive eye assessment for infants in their first year of life, offering early detection of potential eye and vision problems at no cost. This is a critical time for eye and vision development, and our optometrists have the experience, as well as, the instruments and resources to provide the most effective primary eye and vision services to infants. For more information, please visit www.infantsee.org.